User interfaces are designed to present different interface configurations in different scenarios, or to modify their appearances in response to user interaction. Often, there are a set of changes that are made concurrently, such that the interface could be seen to be internally changing from one state to another. This applies generally to interfaces regardless of their complexity. A photo viewer may initially present images in a grid, and when an image is clicked, change to a detailed state where the individual image is expanded and the interface is changed to present new options for image editing. At the other end of the scale, when a button is pressed, it may change to a pressed state in which its color and position are modified so that it appears to be pressed down. Show some UI items and hide others. Present different available actions to the user. Start, stop or pause animations. Execute some script required in the new state. Change a property value for a particular item. Show a different view or screen. 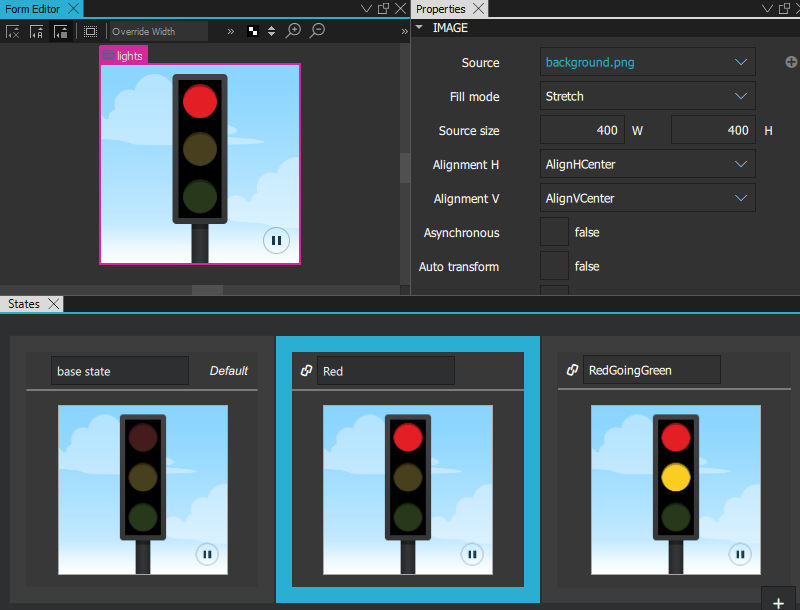 The State pane displays the different states of the component in the Design mode. The State pane is collapsed by default to save space. Select Expand in the context menu to view the whole pane. To add states, click the button. Then modify the new state in the editor. For example, to change the appearance of a button, you can hide the button image and show another image in its place. Or, to add movement to the screen, you can change the position of an object on the canvas and then add animation to the change between the states. To determine when the state should be applied, select Set when Condition in the menu and specify a when property for the state. You can preview the states in the State pane and click them to switch between states on the canvas. QML states typically describe user interface configurations, such as the UI controls, their properties and behavior and the available actions. For example, you can use states to create two screens. To add states, click the empty slot in the States pane. Then modify the new state in the Form Editor or the Properties pane. The properties that you change in a state are highlighted with blue color. In the Text Editor, you can see the changes recorded as changes to the base state. Align items on different screens with each other. Avoid excessive property changes. If an item is invisible in the base state, you must define all changes to its child types as property changes, which leads to complicated QML code. Minimize the differences between the base state and the other states to keep the QML code short and readable and to improve performance. Avoid problems when using transitions and animation when changing states. In the base state, add all items you will need in the application (1). While you work on one screen, you can click the icon to hide items on the canvas that are not part of a screen. In the States pane, click the empty slot to create a new state and give it a name. For example, Normal. In the Properties pane (2), deselect the Visibility check box or set Opacity to 0 for each item that is not needed in this view. If you specify the setting for the parent item, all child items inherit it and are also hidden. 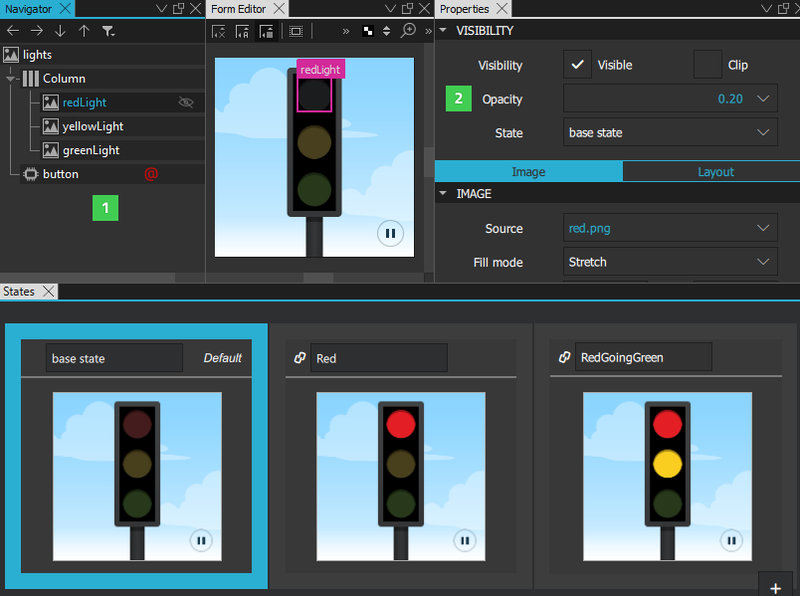 Create additional states for each screen and set the visibility or opacity of the items in the screen. To make movement between states smooth, you can specify transitions. You can use different types of animated transitions. For example, you can animate changes to property values and colors. You can use rotation animation to control the direction of rotation. For more information, see Animation and Transitions in Qt Quick. You can use the ParallelAnimation type to start several animations at the same time. Or use the SequentialAnimation type to run them one after another. You can use the Text Editor to specify transitions. For more information, see Transition.